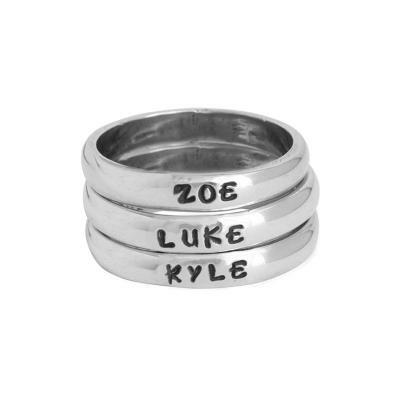 This personalized stackable set of three mother's name rings is simple yet meaningful. What a sweet statement to have all three kids wrapped around your finger. This set of three stackable Mother's Name Rings are a precious gift for the mother of three. Customize with a name on each ring and have your kids neatly stacked on your finger. When stacking three rings together on one finger you might consider going up a half size to accomodate for the width of three stacked rings. Sizing: When determining your size, we ask that you give us a size that is a snug but comfortable fit but we suggest you go up at least a half size if you plan on wearing all three bands at once. If you are unsure of your size, you can order a ring and select the option for ring sizer from the dropdown and we will send you a ring sizer and instructions on how to send us your size.